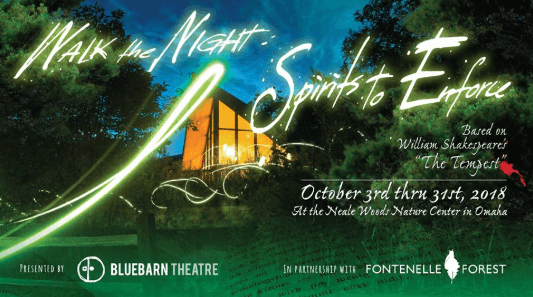 The fifth installment of BLUEBARN’s acclaimed immersive theatre series is located once again at Fontenelle’s Neale Woods Nature Center. You’ll choose from one of four different ways to experience the first half of the show. Come again and choose a different Act 1 ticket for an entirely different show. With four main pathways, simultaneous action taking place throughout the space, and multiple decisions to make as you chart your course through the story…the best way to fully experience Walk the Night: Spirits to Enforce is to come more than once. There are no set theatre seats. Guests are free to explore. Comfortable footwear is recommended. Performances include acrobatics, dance, fight choreography, live music and possible 1-on-1 interactions. ADA-compliant pathways are readily available.You begin either by venturing ahead into the unknown forest, or by staying in safety with your group. The encounters you have and decisions you make will determine how you witness the orchestration of what may well be a plot for revenge…Showtimes: Thursdays-Sundays @ 7:00pm with a second show on Fridays and Saturdays @ 9:00pm. There will be two special performances October 30 and 31@ 7pm. Single tickets are $25 General/$20 Senior/Student. Unlimited Passes available for $45 General/$40 Senior/Student. Location: Neale Woods Nature Center, 14323 Edith Marie Avenue in Omaha, ½ mile north of Hummel Park. Delve into the alternate universe of Dungeons & Dragons, filled with a five-eyed dragon, homicidal fairies and loads of 90s pop culture nostalgia. Following the death of her sister Tilly, Agnes Evans discovers Tilly’s Dungeons & Dragons notebook and stumbles into an imaginary world where she begins to better relate to her often-misunderstood sister. Packed with humor and heart, this coming-of-age adventure/comedy explores the world of fantasy role-playing games and the rare opportunity to connect with a lost loved one. Written by Qui Nguyen | Director Beth Thompson. Showtimes: Thursday – Saturday 7:30 pm, Sunday 2:00 pm. Admission: Adults $24-$50 – Ticket prices vary by performance and seat location. For tickets: (402) 553-0800. Disclaimer: Contains adult language, sexual themes and stage violence. There will also be an opening night reception with refreshments.Dracula tells the story of an English solicitor named Jonathan Harker who visits Count Dracula at his castle in Transylvania to conduct a real estate transaction. He’s nervous about the visit, nothing the fear in the peasants who live in the surrounding countryside. Soon, Harker discovers the source of their fear: Dracula is a vampire.Adapted by Ryle Smith | Directed by Angela Dashner. Disclaimer: Contains adult language and violence. Suggested PG-13Join us for Halloween with a special showing on Wednesday, October 31 @ 9:00 pm – there will be treats and maybe some tricks. After the show, there will be a talkback with the artistic staff and actors. Showtimes: Fridays and Saturdays at 7:30 pm. Adults $20 | Senior/Military/TAG (special) $15 | Students $12.